In celebration of the fact that I am exhibiting at Origin, that opens next week (eeek!) 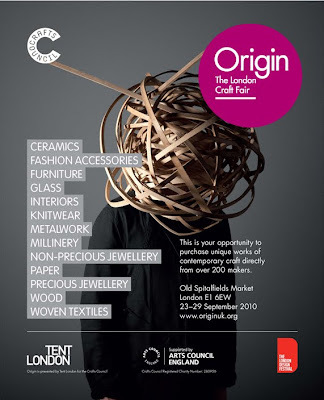 I am giving away 2 tickets to Origin (each ticket admits 1 person). So if you are going to be in London 23 - 29 September then all you have to do is comment below for a chance to win one of the tickets. Please include an email and the day you would like to attend. Deadline Monday 20 September. If you would like to get hold of more tickets you can book them here http://www.originuk.org/ and if you quote my stand number L07 you can buy them at a concessionary rate of £8. I am coming to see you and the other 200 + artists on thursday 23rd! Can't wait!